MESEUM is an art and design exhibition showcasing the work of 21 graduating students from Visual Communications program at Medicine Hat College. On display April 13 to 25, 2013 with the opening reception on April 13 beginning at 7 p.m. Opening night will give you attendees the opportunity to speak with the artists and designers about their current work. Live performances and refreshments will be included in the evenings events. Graduating students have recently wrapped their first community campaign, “Pop Up Portrait Studio”. Students volunteered to attend local events with a large gold frame and photographer to provide free portraits. All portrait participants will be displayed in a photo installation as part of the art and design exhibition, MESEUM. MESEUM will be launching its “Frame Me” campaign the first week of April. 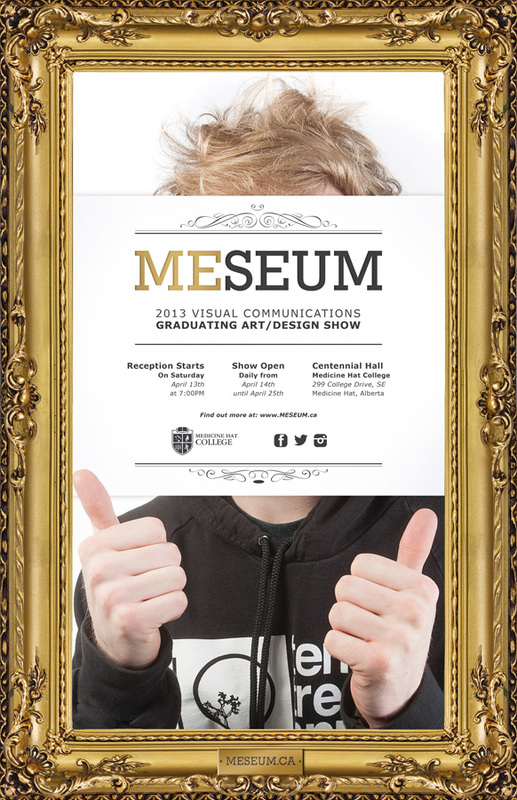 Visit www.meseum.ca for more information about exhibitors and to follow and participate in our events. Reception starts on Saturday, April 13 at 7PM. Show open daily from April 14 to April 25. This entry was posted on Wednesday, April 3rd, 2013 at 11:32 AM and is filed under Art Events, Medicine Hat College. You can follow any responses to this entry through the RSS 2.0 feed. You can leave a response, or trackback from your own site.